Shopping for a Cartomizers, Tank or coil? Cartomizers are refillable tanks that replace cartridges. Unlike cartridges, vapor production does not decrease as the e-liquid runs low. 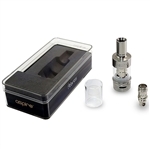 Built in atomizers aka coils give you continuous maximum vapor output. The Kangertech Sub Ohm Hybrid Tank, Aspire Atlantis Tank, Eleaf GS Air Atomizer Tank and Innokin iClear30 Dual Coil give unbelievable amounts of vapor at a great price.